PROJECTS - Nelson Parametrics Inc. Located in the heart of downtown Toronto, at Yonge and Dundas, this 150 ft steel tower, was partially demolished and rebuilt. 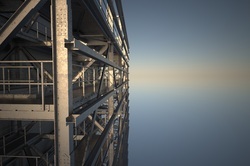 New steel support for sections of the tower, including static and LED signage, was designed in accordance with the existing structure. Due to the inaccessibility of certain areas, we modeled numerous details with the use of site photographs and surveyed dimensions. This floating staircase was 3D modeled for Feature Walters. The original concept was designed by Callison Architects for 5th Avenue in New York. LED lights sit beneath exotic wooden treads. We modeled and adapted the cladding and intricate molds in order to honor the original design intent of a single, sweeping, seamless, guardrail, while working within the confines of site and code requirements. 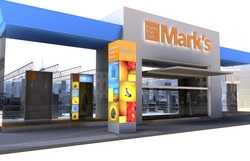 For this project, Nelson Parametrics aided in the redesign of interior space and exterior signage of the Mark’s Retail Store. This plan was implemented in order to attract and inform their customers, and enhance customer experience with the retail brand. Nelson Parametrics offers a wide range of services. This project included fabrication drawings and assembly models of three types of modular aluminum bent metal buildings, for a government funded project. The concept of this design allows for the ability to reuse assemblies in several configurations and sizes. The buildings were pre-fabricated in shop, prior to shipping.